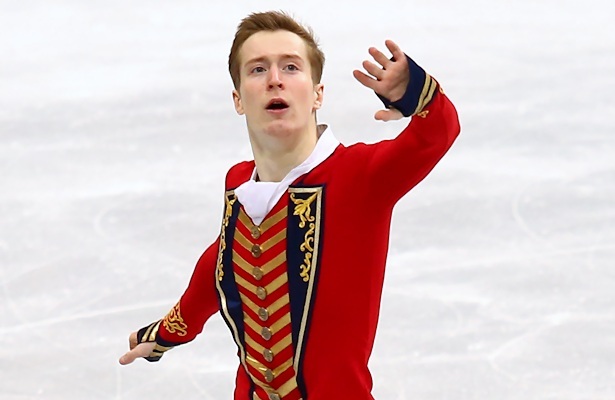 Russia’s Alexander Samarin performs his Free Skate at the 2019 European Figure Skating Championships. Last month, Alexander Samarin headed into the ISU European Figure Skating Championships as the “number three” of the Russian men. The national bronze medalist competed alongside teammates Maxim Kovtun, four-time and current Russian champion, and Mikhail Kolyada, two-time Russian champion and current silver medalist. In a field of what began with 37 men, Samarin took the silver medal, trailing the new and old European Champion Javier Fernandez by less than two points. The 20-year-old put out his best performances this season so far at Europeans to win his first medal at the event with personal best scores after coming eighth in 2017 and sixth in 2018. The Muscovite wanted to try a quad flip in the Short Program for the first time in competition, but he tripled it and stumbled. Including a new element in competition for the first time is a big step for any skater. Samarin has been doing the quad Lutz since the past season, but the flip is new, and the skater surprised himself with how fast he learned it. While Samarin was very pleased to have won his first senior-level ISU Championship medal, he knows how close he came to winning the title. At the same time, however, he was also pleased for Fernandez, to whom he has always looked up to. Samarin is mostly known for his jumping ability and has often been criticized for lacking in the components department. He and coach Svetlana Sokolovskaia have taken that criticism to heart. The 2017 World Junior bronze medalist has started to work with former ice dancer Vitali Butikov to improve his skating skills, and since the fall, has been working on the floor with dancer Ramil Mekhdiev from Igor Moiseev’s famous Russian dance ensemble. The 2018 Internationaux de France bronze medalist acknowledges while difficult, he enjoys the hard work. It was Samarin’s coach Sokolovskaia who brought in the dancer, who used to work with the Alexei Mishin’s skaters. Mekhdiev even travelled to Minsk to support his new student. “He was pleased, but he saw a lot of new things we still need to work on and indeed there is a lot left to improve and there is no time to relax,” Samarin noted. Samarin himself selected the music for both his short and long program this season (“Cold Blood” by Dave Not Dave and music from The Greatest Showman soundtrack). While the Muscovite is now enjoying the biggest success of his career so far, like others, he has had his shares of ups and downs. The Olympic season was a struggle. Samarin battled injuries and eventually missed out on qualifying for the Olympic Games. The skater underwent knee surgery last May, was back on the ice in July, and started jumping again towards the end of August. Samarin has a philosophical take on everything he has had to overcome. The European silver medalist is now preparing for the Winter Universiade in Krasnoiarsk, Russia, in early March, which should be another stepping stone towards his debut at the ISU World Figure Skating Championships in Saitama, Japan. Midori Ito (JPN) was the first woman to land a triple Axel in international competition at the 1988 NHK Trophy. Discuss other ladies who have landed or are currently working on the triple Axel.